Many federal funding programs require applicants to demonstrate that their project is “cost-effective” by submitting a benefit-cost analysis (BCA) showing how the benefits of the project outweigh the costs. It is prudent to ensure that taxpayer dollars are invested in projects that will deliver maximum results. However, traditional BCA (sometimes called a benefit-cost ratio or BCR) imposes unnecessary transaction costs and decreases government efficiency and innovation at both the federal and local levels. This problem is typical for both routine and disaster recovery projects. Current agency practice for comparing benefits to costs is flawed. There is no harmonization between departments and agencies such as the Departments of Transportation, Homeland Security, Commerce and the U.S. Army Corps of Engineers. Each federal agency has its own processes and formulas for developing a BCA. This system creates burdens on both federal agency staff and the cities applying for federal funds, because applicants are saddled with additional transaction costs by having to prepare different BCAs for different agencies, often for the same project. Typical agency BCA methods do not properly account for increasing potential for loss in consideration of future risks, such as impacts of climate change. BCA methods do not adequately allow project applicants to capture a project’s economic, social and environmental co-benefits, including ecosystem services, or adequately quantify externalities of either cost or benefit. The discount rate is a rate set by the Office of Management and Budget (OMB) to determine the “present value” of the investment being made, using the concept of the time value of money to normalize when benefits are realized. However, it generally does not accurately account for future risk, or for projects like wetland restoration that appreciate over time. The complexity of the BCA process for many federal grants discourages smaller communities with fewer staff and less resources from applying for competitive grants such as FEMA’s Pre-Disaster Mitigation program grants. 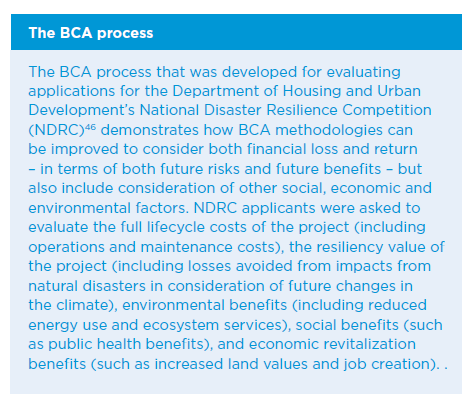 The problems with federal BCA requirements are particularly acute for cost assessments of innovative and multi-intentioned projects, as illustrated by the challenges of replacing traditional “gray” infrastructure with green or nature-based infrastructure. These approaches use or mimic natural systems, such as wetland restoration to allow areas to flood or artificial reefs to diffuse wave energy, and such investments can appreciate over time and provide multiple environmental (e.g., flood mitigation, air and water quality), economic (e.g., job creation, property value increases) and social (e.g., parks, crime reduction) benefits. Without an improved BCA process, green infrastructure project assessment will not compare favorably to traditional “gray” infrastructure, and these types of projects will face difficulty receiving federal funding. Federal agencies should take administrative action to harmonize and align BCA processes across agencies, departments, funding programs and regulatory programs, where enabling statutes permit and to the extent feasible and permitted by law. BCA requirements for different disaster recovery programs that are often used in concert, such as HUD’s Community Development Block Grant-Disaster Recovery and FEMA’s Public Assistance and Hazard Mitigation Assistance programs, should be prioritized for alignment. Federal agencies should account for the full life-cycle benefits of a project in consideration of future risks over the project’s design life, and costs avoided through resilient design. Federal agencies should be encouraged to consider the collateral social, economic and environmental benefits of projects, including job creation, costs, ecological services, public health benefits like improved air quality and water, added public amenities like recreation, and increased property values, among other factors. OMB should be encouraged to revise discount rates, where appropriate, to account for cost-savings when designing structures to withstand future risks, and projects that appreciate over time. In addition to streamlining and increasing funding, cities will benefit from the improved BCA framework. Congress should commission a National Academies study to develop a process for harmonizing benefit-cost analyses across agencies and departments that grant funds or regulate infrastructure and other development projects. This group would be charged with evaluating current agency BCA processes and identifying options for aligning these processes in ways that account for the full life-cycle benefits of a project, future disaster risks to the project, as well as the full range of social, economic, and environmental co-benefits. The utility of this structure would last beyond election cycles. Congress should direct the Office of Management and Budget to review and ensure the consistency of agency cost-benefit analyses and the consideration of future risks and co-benefits. The Congressional Budget Office should ensure that project budget analysis incorporates risk mitigation’s impact on future savings to infrastructure and communities. OMB should direct Federal agencies, where enabling statutes permit, to take administrative action to improve and align BCA requirements and to account for the full life-cycle benefits and co-benefits of projects, including consideration of future risks to project retirement. OMB should revise Circular A-94, which establishes the discount rates that agencies are directed to use when developing BCAs, accounting for the economic benefits of mitigating risks from future hazards and for nature-based projects that tend to appreciate over time. The National Academies, Department of Transportation, Economic Development Agency, and Housing and Urban Development should engage the public, including finance, insurance, engineering and construction, utility, credit rating, and institutional investor communities, in an open dialogue about best practices for conducting BCA for projects with a long design life. These discussions should address calculations of future risks and benefits, given projected climate and other changes.